Your Nikonians Gallery: A brief “how to” manual. As a member of Nikonians, you have your personal Nikonians Gallery. We provide free space for basic membership level and large space with NEF, DNG and TIFF photo plus video storage and collaboration support, such as client proofing, for Gold and Platinum levels. You also have your own portfolio included in these memberships. A portfolio consists of a set of your best images from your gallery, showcased under your unique Internet address plus on the portfolio overview - If you are interested to learn more about showcasing your best images in your own portfolio, please see this. Your Nikonians Gallery is built for image/photo sharing inside and outside of the community. It also makes for easy sharing and discussing images in the forums, for general feedback or when you are asking for critique and want to receive comments on your work. Below is a short version to get you going uploading images to your Nikonians Gallery. A more detailed guide is further below on this page. If you are using a Mac computer, we strongly recommend that you use the Nikonians Uploader for Mac. Else, for web upload use these instructions. Note: We are going to release a Windows (and Linux) version of the Uploader later in 2019, including an Adobe Lightroom plugin. If you want to upload and directly share some of your images in a forum, then navigate to the forum in question and click the "Upload images" button. The "Upload images" button, shown in the forums in the top right area, is the fastest way to upload images to your gallery while showing them in a post. The title and description you enter will be used for both the forum post and for the individual images themselves when they are stored in your Nikonians Gallery. 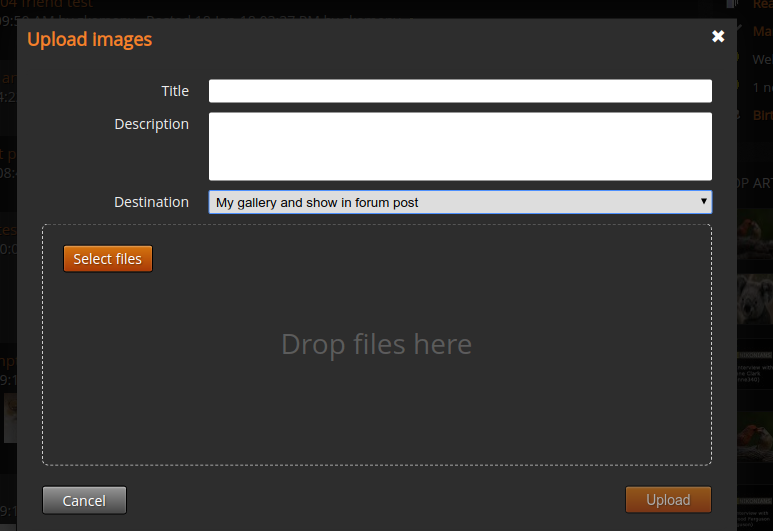 You can select a destination for the images, which is by default "My gallery and show in forum post"
You can also select "Only show in forum post". Selecting this option and the images are not included in your own gallery, but are still shown in the forum post. We are using a specific system account in the galleries to achieve this. In the "Galleries" menu, select "Upload Photos"
The upload window is now shown: Here you select the files you want to upload, give them a common title and description plus you select the destination where they shall be stored: In your public gallery, in an album of yours or in one of the public "Master Your Vision" categories. Fill in title and description which will be applied to all images you upload in the current batch. Select destination: Leave as is to upload to your public member gallery. Click on the "Options" section to optionally set various settings. Select up to 20 photos to upload. Each max 100 MB. JPG, PNG, GIF, NEF, DNG and TIFF works. Raw formats and TIFF only available to members on Platinum and Gold membership level. ZIP archives with images can also be uploaded. Click the "Upload" button at bottom of page. When the upload has finished, you will see thumbnails of the images uploaded at the bottom of the upload screen. That's it. If you want to view your images. Select "My Photos" in the Gallery menu or by clicking the button at the bottom of the view. What is the Nikonians Gallery? Who can use the gallery? This page was last modified on 15 April 2019, at 17:14. This page has been accessed 102,413 times.